Constructed from acoustically-superior stainless steel, the MDF MD One Infant Stethoscope delivers accurate auscultation of heart, lung, and Korotkoff sounds with acoustic integrity and clarity. An ergonomic design ensures comfort for the doctor and patient,even during extended use. 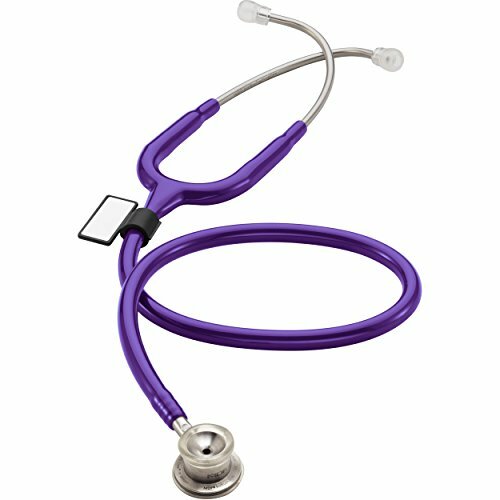 The MD One Infant Stethoscope is a premier diagnostic instrument with unmatched performance, durability, and aesthetics. Chestpiece: The handcrafted stainless steel dual-head infant chestpiece is precisely machined and hand polished for the highest performance and durability. The full-rotation acoustic valve stem with green indicator dot allows the user to easily identify the active sound channel and seals in sound. The chestpiece is fitted with an ultrasensitive infant diaphragm sealed with a non-chill retaining ring to provide a secure acoustic transmission. The infant bell, crowned with a non-chill bell ring, provides greater sound amplification, isolation of low frequencies, and patient comfort. ErgonoMax™ Headset: Hand polished, pre-angled stainless steel headset features a patented internal dual-leaf spring construction for durability industry in user safety. Patented SafetyLock™ eartip adaptors lead the industry in user safety. Included Accessories: 2 extra sets ComfortSeal™ eartips, spare ultrasensitive diaphragm, and ID tag. 100% STAINLESS STEEL CONSTRUCTION > Acoustically-superior stainless steel. Available in 13 colors! If you have any questions about this product by MDF Instruments, contact us by completing and submitting the form below. If you are looking for a specif part number, please include it with your message.